One of a kind girl seeks BFF! 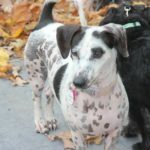 Penny is a unique mix of Chinese-Crested and Beagle giving her delightful personality and combined with her adorable look. As long as this harlequin beauty has her peeps with her, she’s on cloud nine. Nothing makes Penny happier than being with her humans and she has yet to meet a person she doesn’t greet with epic kisses. She is a smart girl and she may try to get the better of you with her puppy dog eyes. She’d be great for an active couple or a family with older children. She is great with dogs, but is also ok on her own. She is ok with some cats, but may chase if a cat ran. Penny is both crate-trained and house-trained. She has sophisticated tastes and prefers a little classical music or white noise to comfort her while you are out.